Canada Post says densely populated urban centres in the country’s largest cities will be the last to lose their door-to-door delivery service. The postal service says the older neighbourhoods and smaller lots in the urban cores present “different challenges” for locating community mailboxes than those in suburban areas. Most of those neighbourhoods will be left until the “final stage” of the multi-year phase-out, Canada Post said in a statement Wednesday. The postal service “will take the necessary time to understand their unique needs and find solutions that work for these neighbourhoods,” it added. 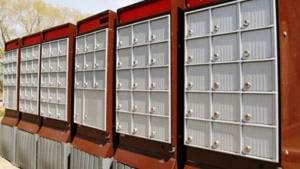 Canada Post has come under heavy fire since it announced last month it will phase out urban home delivery over the next five years, in favour of large, community mailboxes. The move has raised many questions including how the new mailboxes will be squeezed into the limited space of crowded urban neighbourhoods. Others say the loss of door-to-door service threatens to cut off those with limited mobility, such as seniors and the disabled. Hundreds protested the move in Ottawa over the weekend and NDP Leader Tom Mulcair said recently his party intends to bring the issue to a vote in the House of Commons. Officials in cities including Vancouver, Victoria and Montreal have either spoken out against the idea, or asked for more information. The postal service will be losing $1 billion per year by 2020 if changes are not made, according to a 2013 Conference Board of Canada study! Canada Post said Wednesday it will work with community and municipal leaders to choose “safe and appropriate sites” for the new boxes, the first locations of which are to be unveiled next month.